February is time for Valentine’s Day and more cold weather, possibly snow! And Valentine’s Day can mean chocolate, did you know February is National Chocolate Month? So why do we like chocolate so much? Besides it’s yummy flavor, it could also be the release of happy, feel-good hormones—serotonin and dopamine—that we all get when we eat chocolate. But too much chocolate in our diets and the scale may be unhappy. This month, come to Be Happy Yoga & Salt Cave for a dose of feel-good hormones without the scales screaming back at you! 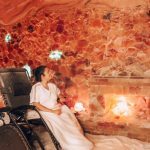 At Be Happy Yoga & Salt Cave we will help you relax your body to reduce your stress levels and even make them more manageable in the future, allowing your body to focus on keeping you healthy and enjoying life. 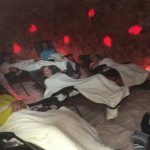 Experiencing a unique treatment is also a great way to release happy hormones into your body and relax your body, mind and soul. Holly Cherry, LMT, offers her unique massage, called Ashiatsu Oriental Bar and Ashiatsu Thai, and fusions of those plus traditional Swedish massage. An Ashiatsu massage is firm pressure on your body using feet! 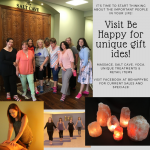 Caroline Morris, LMT, offers Himalayan hot salt stone massage, 30 minute deep tissue massage, therapeutic Swedish massage, prenatal and chair massages. We have added some Add-On options too! (Bio mat & CBD oil) We have 3 yoga teachers offering Thai Yoga Therapy, and Shigeko has Reiki sessions available for evening and weekend appointments! Just a brief mention of our treatment types hopefully has you interested in coming by to see our studio and learn all about these unique services to relieve and revive! Looking for a Couples Massage? 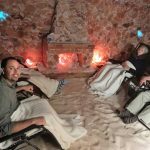 We offer couples massage IN the salt cave as well as in the Yoga Room by pre-scheduled appointments only. Call now as availability is limited to 6 total appointments for the holiday season! 60 minutes of massage is wonderful but the whole experience will be a memory forever! February will also be full of fun activities and workshops at Be Happy: Kids Beach Yoga (yoga in the yoga room along with “beach” time in the salt cave with beach toys—children 10 years and younger) Guided Meditation in the Salt Cave is a great way to experience the salt cave. Deann King, RYT 200 will offer another Chakra workshop and Christie will present an essential oil workshop on emotional well being (make & take!). Don’t let chocolate be the only treat you give yourself or your Valentine this month! Come to Be Happy to experience some peace! Be Happy, Breathe Easy. Come visit us in person (Monday – Saturday: 10 a.m. – 6:30 p.m., Sunday: 1 p.m. – 6:30 p.m.). We are located at 2710 Nashville Rd., Suite 104 (in the Kroger Shopping Center at the corner of Campbell Lane and Nashville Rd). Visit our website (behappybg.com), our social media (@behappybg) or call us (270-799-8070) for more details.